I wrote this to learn JavaFX, and as an excuse to re-make the Game of Life. This is the most complex GUI I've ever written, so I'd like feedback mainly on it, but I'll welcome any criticism! My version differs from the original in that cells inherit their neighbour's color when they're born, which leads to interesting "war" scenarios. It's also technically "1-player", as the user can intervene by painting new live cells right onto the field to affect the evolution. All of the settings that the controls affect are global; they're (private) instance members of the application class. I know that in general, this is bad practice, but I'm not sure how else to set it up. If I have an event handler that needs to change a setting, short of threading every setting through the handlers and the main-loop, I'm not sure how else it could be accomplished. The general set-up of the controls in the code. Is there a standard way of creating/setting up controls? Here, I've segregated set up of controls into functions based on which bar they belong to. It works, but I can see it getting out of control with more controls added. The GOL class (Environment) is actually faster than I expected, but it gets quite slow at around 500x500 cells. Is there anything I can do to help speed it up? Anything regarding layout of the GUI. Note that currently this isn't a "real" GOL clone in that it's not infinite. When a cell exits the screen, it's no longer "seen", and is erased the next generation. This leads to the corruption of classic patterns if they collide with the end of the world. * Gets the chosen dimensions of the environment as decided by the sliders. * Gets the chance that a cell should live during a repopulation as decided by the slider. * Finds the chosen area as decided by the sliders, and sets it. area.getX() + " x " + area.getY() + "\n" + (int)(getLifeChanceBySlider() * 100) + "% chance"
* Outputs an error to the System.out in the event of a parsing error. * An object representing a Game of Life environment. * The currently living cells. Any cell not explicitly alive is considered dead. * @param range The depth to check from the centre coordinate. * @return A reference to the instance speciesFreqs recorder. *  species it should adopt. * @return The species the cell should become, or null if it's dead. * @param range The amount to increase the loop by in each "direction"
* Clears and replaces the current population with a randomized population with the indicated traits within the indicated bounds. * A simple mutable integer class to assist in efficient species counting. * A class to assist in counting the number of each species surrounding a cell. * Figures out the dominant counted color. Considers the last species added to be dominant in the event of a tie. * @return The most-occurring species counted, or the last species in the event of a tie. * @param updateEveryNS How often to run the loop. * @param f The main-loop body. Its parameter is the number of nanoseconds since the last update. Manifest constants typically use _ for space in Java. So NANOSPERSECOND for example should be NANOS_PER_SECOND. Also I believe that the name MainLoop is quite misleading as a name because the class isn't actually your main loop but rather a timing helper. The result is the same because you're truncating anyway. 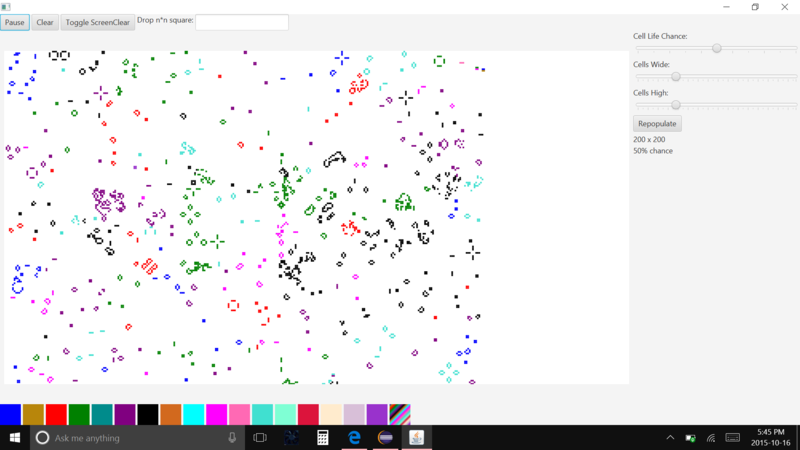 Your class GameOfLife mixes all three of model, view and controller. It is very desirable to keep these separate. What I would do is to separate everything that has to do with the game simulation: isPaused, cellsWide/High, the mainloop etc and put into a new class GameOfLifeSimulator. Next I would separate the UI design from the class and put it into an FXML document that describes the UI. Then I would have a separate controller class for the FXML document and leave the application class just as a pretty basic launcher. If what I just said sounds like gibberish, have a look here: Model View Controller. and in the fxml you would have an attribute saying onAction="startStopSimulation". To link the button action to the method in your controller. This here will get you started with FXML. JavaFX controls are built on the powerful concept of observables, properties and bindings. An observable is a class that wraps an object that allows you to listen to changes in the object. A property is a value that is observable. A binding is a way to create an expression that is bound to the values of properties, using the fact that they are observable. So if a property changes, so does all bindings that depend on it. And finally, you can bind the value of a property to a binding so you can effectively link properties to each other and create arbitrary expressions of your properties and bind those expressions to other properties. More info here. To create a binding, a kind of numerical expression that can be evaluated. And whenever you need the scale factor simply call: averageScaleFactor.get(). The result is cached and automatically updated as soon as either the canvas or the sliders change. So the above snippet will eliminate the getAverageScalingFactor method. Going with the Model-View-Controller idea, your "model", the GameOfLifeSimulator would have: IntegerProperty cellsWide/High; that you would bind to the value of the sliders of your UI ("view") in your "controller". And they would automatically be kept in sync. Avoid allocating new objects in your game loop. I see that you frequently allocate new Position elements in your game code. While memory allocation is cheap in Java, frequently allocating objects and throwing them away like you're doing will cause a significant strain on the GC and can cause your game to appear "jittery". I would advice to allocate the position objects once and re-use them where it makes sense. you allocate a new position for each of the $$4\cdot range^2$$ elements checked when you could get away with simply allocating pos once at the top and re-using it. This whole allocation and disposal of Position objects seem to be centered around the fact that you're using a Map<Position,S> to represent your live-state of the game. This may also be a cause for your performance hit, every access you make to the map requires that you must calculate the hash-code of these positions over and over again. It would probably be faster if you just used Integer as key and used a custom hash function like so x + MAX_WIDTH*y. The function is collision free and faster to calculate than the hashCode of your Position class. Also you avoid straining the GC. Another thing that might be even faster is to simply have a large array List<S> cells = new ArrayList<>(cellsWide * cellsHigh); and let dead cells be null. Access is done by cells.get(x + cellsWide*y) which avoids the lookup of the map and the computation of the hash code. It also will allow you to ditch allocating Position objects all over the place. However it does mean that the resize behavior of the game changes and you will have to reallocate and copy the field when that happens. However that is a rare event compared to how often the simulation is ran so I believe you will gain performance on this. This is as far as I feel it is useful to go in this review. The best thing you can do is to separate your model, view and controller and reduce the load on the GC in your game code. The frequent allocation and disposal of Position objects and the expensive hashCode function is a likely suspect for your performance issues. Not the answer you're looking for? Browse other questions tagged java game-of-life javafx or ask your own question.